Malaysian Bioeconomy Development (Bioeconomy Corporation) and SIRIM Berhad have introduced eco-labelling certification schemes, in a bid to increase the production of eco-friendly products in Malaysia. SIRIM ECO 001:2016 Degradable & Compostable Plastic Packaging Materials and SIRIM ECO 009:2016 Biomass Based Products for Food-Contact Applications have been developed by SIRIM as eco-label criteria for the producers. The scheme has been designed to certify products under SIRIM Eco-Labeling scheme as environmentally-friendly, helping to boost green consumerism and as sustainable development in the country. Bioeconomy Corporation acting CEO Tuan Syed Agil Syed Hashim said: “Bioeconomy Corporation has been constantly promoting and nurturing companies involved in bio-based plastics and packaging products in the local market, including BioNexus and Bioeconomy Transformation Programme (BTP) companies. The SIRIM ECO 001:2016 criteria is applicable to all plastic sheets and films, which are in the form of bags or packaging materials. The SIRIM ECO 009:2016 criteria has been designed to be applied to biodegradable and compostable biomass based products that can be used for the purpose of food serving and packaging. Owned by the minister of finance incorporated and federal lands commissioner, Bioeconomy Corporation is agency for the bio-based industry in Malaysia. 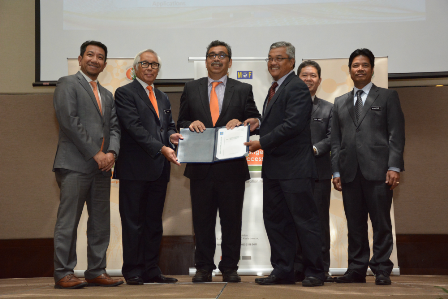 Image: Bioeconomy Corporation and SIRIM Berhad have introduced eco-labelling certification scheme in Malaysia. Photo: courtesy of MALAYSIAN BIOECONOMY DEVELOPMENT CORPORATION SDN BHD.